A crab boat off Newfoundland catches fire, and a rescue is undertaken by helicopter. A child goes missing in a New Brunswick forest, and a desperate hunt is mounted. A climber falls on a British Columbia mountain, and a helicopter rescue is attempted. 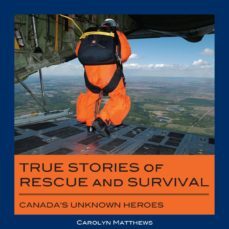 A civilian chopper crashes in Nunavut, and a search-and-rescue team braves a savage snowstorm to find survivors.True Stories of Rescue and Survival features the above true stories and many more from across the country, past and present. Its heroes are to be found in the RCMP, city police forces, the Canadian military, and among all the rescue workers and specialists of the Canadian Coast Guard. Volunteers, too, risk injury and even death to help others.Sidebars spotlight the equipment search-and-rescue teams use, how search dogs are trained, how long-line rescues work, how navy divers are making a difference in the deserts of Afghanistan, and much more.